is one of the largest academic specialty councils of the ACA. It was founded with the purpose of promoting the orderly advancement of chiropractic as a science and healing art. It assists and cooperates with the parent organization to gather, correlate and disseminate knowledge and information concerning the use of nutrition in the practice of chiropractic. All our efforts are directed toward the benefit of our members, the profession and the public. To encourage and promote a more advanced knowledge and use of nutrition in the practice of chiropractic. To be a liaison with our teaching institutions. To encourage professional consultation with members of other professions. 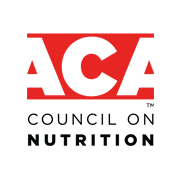 To sponsor and promote seminars and courses of study in nutrition, both separately and in cooperation with other ACA councils. To be and remain a charitable organization availed only for chiropractice purposes, as provided in Section 501(c)(3) of the IRS code. These are held with speakers of national and international reputation. These are provided in concert with our CCE accredited colleges and usually supported by a Grant from our industry. These Seminars help provide the opportunity, etc., for the chiropractic college student and practitioner alike to have dialogue with our speakers with national standing in the field of clinical nutrition. The Journal of the Council on Nutrition is published quarterly by the Council. Correspondence should be directed to: 6855 Browntown Road, Front Royal, VA 22630. The newsletter serves as a forum for new products, ideas and dialog. It helps to keep members abreast of current trends -- political, legislative and educational. Do you have an article you'd like us to publish. Click here to download our guide with instructions on How To Write Articles. The Council serves as a consultant to the profession and public, including state peer review committees, third party organizations and government bodies. Sec. A. To promote the orderly advancement of Chiropractic as a science and healing art. Sec. B. To assist and cooperate with the parent organization, the American Chiropractic Association. Sec. C. To gather, correlate and disseminate knowledge and information concerning nutrition for the benefit of its members, the profession and the public. Sec. D. To encourage and promote a more advanced knowledge and use of nutrition in the practice of Chiropractic. Sec. E. To maintain liaison with our teaching institutions. Sec. F. To establish a means through which the public shall be regularly informed and educated in the area of nutrition. Sec. G. To be and remain a charitable organization availed only for charitable purposes as provided in Section 501 (c) (3) of the Internal Revenue Code of 1954, as amended, as an organization formed or availed for gathering, correlating and disseminating of knowledge and information concerning nutrition for the benefit of its members, the profession, and the general public. Sec. H. To protect in every proper and reasonable way the professional welfare and interest of the members of this Council. Sec. I. To promote the highest standards of moral and ethical conduct. Sec. J. To promote research in Nutrition. Sec. K. To encourage professional consultation with members of other professions. Sec. L. To encourage the development of standard terminology in nutrition. Sec. N. To cooperate with state chiropractic associations, board of directors, officers, and all other related committees, councils and departments. Sec. O. To sponsor and promote seminars and courses of study in Nutrition either separately or in cooperation with other ACA Councils. The applicant must hold the degree of Doctor of Chiropractic. In addition, he or she must show evidence of having completed at least three (300) hours of postgraduate study in nutrition sponsored by a college holding status with an accrediting agency recognized by the U.S. Department of Education, or an agency having a reciprocal agreement with the recognized agency or having completed a residency under the auspices of a college having status with an accrediting agency recognized by the U. S. Department of Education, or an agency having a recognized agreement with the recognized agency. The course offering must be presented based on a syllabus prescribed by the school. The applicant must be licensed to practice chiropractic.